Established in 2002, Frontier Flowers of Fontana has built a solid reputation as the Geneva Lakes area’s premier floral design studio. Proprietor and principal designer Renee Cerny is an award-winning artist who is highly sought after for her expertise. She and the studio have had the honor of being published in several national publications and notable wedding blogs. Renee was awarded the “Best Design People’s Choice” for all three voting rounds at the Milwaukee Art Museum’s “Art in Bloom” 2013, an accomplishment unparalleled in the history of the event. 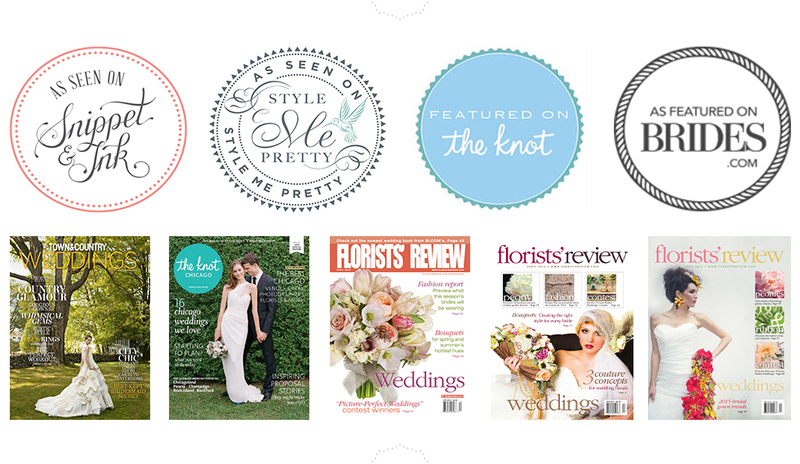 In yet another unprecedented achievement, Renee and the studio had the honor of being awarded “Best Wedding Overall” in Florist’s Review Magazine for the years 2013 and 2015. Her designs were also awarded “Best Bouquets Overall” in Florist’s Review Magazine in 2014. Renee’s dedication to bringing her clients the very best in design and flower quality have helped cement the studio’s reputation as a leader in producing artistic and stylish florals and events. In addition to our reputation for producing extraordinary designs, Frontier Flowers of Fontana is renowned for including unique and unusual flora in our work. We use a broad network of suppliers that includes growers operating international flower farms all the way through local flower fields to bring our clients the most abundant selection options available. Blooms selected for all compositions must meet the studio’s strict standards for quality and freshness. The end result of this unrelenting commitment to quality is reflected in our superior finished product.